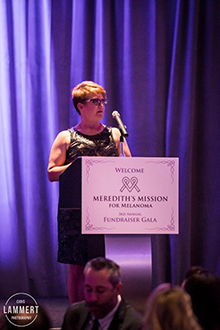 2019 - 4th Annual Meredith's Mission Gala! 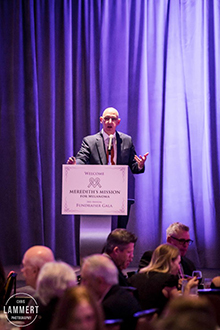 Our 4th Annual Gala will be held at the Austin Hilton on April 27, 2019. Information will be coming soon about purchasing tickets and this years program. Check back soon for all the details! In support of the costs associated with maintaining equipment used by both Dr. Michael Tetzlaff and Dr. Mike Davies in the Department of Melanoma Medical Oncology. The autostainer has helped multiple researchers in characterizing immune cells in tumor biopsies of patients receiving treatment for advanced melanoma and in providing insights into the key determinants of resistance to immunotherapy. The Seahorse Bioanalyzer determines the metabolic characteristics of cells leading to new insights in the role of metabolism in both metastasis and therapeutic resistance in melanoma. New medicines are now being developed that target metabolic pathways and are being used in a number of upcoming clinical trials. Along with last years’ donation, this will fund the confocal microscope requested by Dr. Adewole Adamson, assistant professor in the Department of Internal Medicine. The confocal microscope is a noninvasive, high-resolution, skin imaging tool that has become an important adjunct in the diagnosis and management of melanoma. President, Christopher Kluck, was interviewed by Sports Illustrated for their “Everything You Need to Know About College Football Tailgating” article that appeared in the August 23, 2018 issue. Once again our Tailgate Fundraiser was a great success. Check our Tailgate2018 page for all the details! 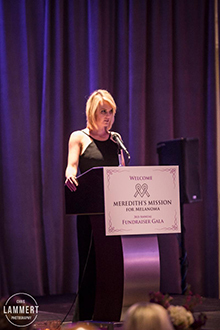 We were truly humbled by the success of this year's Gala! Between the Gala proceeds and your personal donations, we have grossed over $125,000 so far in 2018 - almost double from last year at this time! We want extend our thanks again to Dr. Declan Fleming from the U.T. Dell Medical School, who brought us news regarding the equipment that we are helping fund for melanoma cancer research and to both Katie Rinehart and Brianne Dart for sharing their personal melanoma experiences. Through Brianne and Katie's son, Nicolas, we know that our efforts are making a difference in melanoma patients lives, as well as bringing hope for better and more expansive treatments. We especially want to thank our extremely generous Gala Sponsors, In-kind Donors of our Silent Auction, and all of the guests who attended the 2018 Gala! Our event would not be possible without your incredible support! Copyright © 2016 Meredith's Mission For Melanoma | All Rights Reserved.